This is a new year, and an opportunity to begin again. Previously I wrote a few posts on various topics related to generating ideas for blog posts. With all of this knowledge, you might think that I would be a faithful blogger. However, in 2016 I was consistent until September. 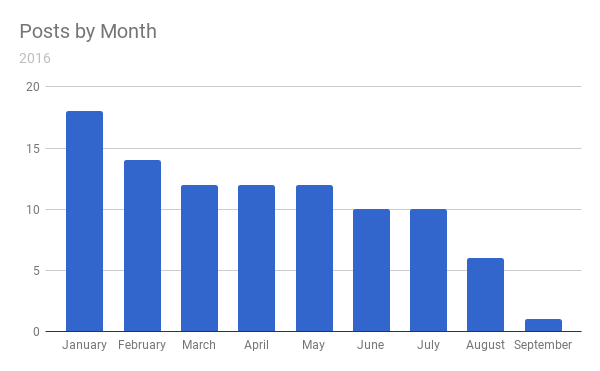 You can see the decrease in the number of posts by month in the chart below. Now, after a lengthy break, I have again decided to start blogging. One primary difference for this new effort is that I am going to have simple posts. I am not going to worry about writing at least 500 words to optimize the Google search. I am going to write the posts I want to write, drawn from a variety of sources, including the suggestions found in the two posts above.